Many people pay high ticket prices to see a speaker these days, so don’t you think they deserve value for money..? I wonder how many companies, which pay multiple thousands of pounds for a speaker, feel they get their monies worth..? You may think I’m turning into a grumpy old man, but as a speaker you must be timely, professional, deliver your message and remember that you are a guest. I’ve seen people turn up late, drunk, scruffy, not know their slides and even be offensive! Frankly this amazes me. I’m not going to name names, but some of these speakers are internationally known celebrities. Of course, famous names make a difference. If you are at a sports awards evening and a famous personality is the guest, just their presence and a few book signings will set the crowd on fire. Well, that’s ok (in my view), but wouldn’t it be wonderful if they could speak well too..? This is one worry I have about the coming Olympics and Paralympics. The speaking market will be flooded with Gold Medal winning athletes who can’t speak for Adam. Now, I’m not taking anything away from their determination, training and skill at winning that precious medal, but speaking is a different world altogether. It is a privilege to stand before an audience, and therefore you have to deliver. Imagine you’re in the gladiatorial arena being looked upon by thousands of people demanding a show. I don’t mean in a violent way, but get used to the fact that you are a performer and the focal point of everyone’s attention. Whatever you say and do, whatever body language you use, everyone will hear and see. You can grasp your audiences hearts and souls and take them on an incredible journey, or you can fail miserably. If you are performing at a ticket only event you do have one advantage – the audience wants to see you. Otherwise why would they have paid..? However, this is no excuse to think that you can get away with not delivering at 110%. At a corporate event you may have an audience who haven’t a clue who you are, it may be after dinner when a few have been drinking, or be tired – still deliver 110%. There are no excuses in this game. One thing a speaker must do well is speak. Sounds obvious enough, but your voice must be clear, without slang, swearing or acronyms. On that last point, I was once in an audience where a speaker was assaulting the room with a three letter barrage. That’s ok, but they needed to explain what they meant. I stuck up my hand and asked the speaker what some of the acronyms meant (as I hadn’t got a clue). A huge sigh came from the room as many people around me were also lost, but too afraid to ask. Use simple language, and a microphone if required, and speak – don’t shout. Q & A is a vital part of many presentations and gives the audience time to interact with you as a presenter. Give clear answers to questions, and ask the audience questions too. Make them think, provoke a response and you will have them in the palm of your hand. Use humour if you wish, but never comedy (unless you are a comedian). I like to get into my audiences and break the stage barrier as I find that close eye contact works. Also it allows people at the back of a room to engage with you up close. I’ve worked in engineering for many years and attended an in house presentation course in my early twenties. It gave the (very) basic skills needed to present, but that’s only the beginning of the journey. How many of you drive a car..? How did you learn..? You took your lessons, passed your test and then you learnd to drive. Speaking is no different. Experienced as you think you may be, you should never assume that you’re too good to learn (and keep learning.) 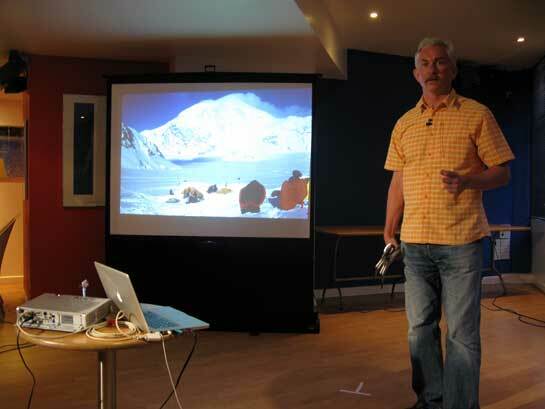 I have spent the last 20 years honing my skills across the UK and Europe and learned a great deal about myself, my speaking skills and my audiences. On-going support is vital as a single days presentation course is never enough. Here is where a Mentor or the Professional Speaking Association come into their own. On-going feedback is also vital. I am always open to criticism (even if it hurts), because it is one of the best ways to learn. Remember, speaking won’t kill you..! Your heart may race (in fact it should), and a few beads of sweat may fall, but take all feedback for what it is and react accordingly. If you really want to find out how good you are (or think you are), then there is the ultimate test – a room full of teenagers! They hold little fear in ignoring you, listening to their mp3 players, even walking out halfway through. If you can hold them in the palm of your hand for an hour or so, you’ll learn more about your own skills than any course I know. I don’t usually point out individuals (good or bad), but on this occasion I’ll make an exception. If you want to see an excellent speaker, then find out where Julie Summers is presenting. See this blog about her excellent speaking. These are only a few tips on how to speak. There are so many more than I can put in a blog. Of course, if you want to learn from an expert then get in touch. So please I beg of you, no slides with 147 words on (the record so far), graphs people can’t read, monotone voices, walking in late, no preparation, staring at the floor, looking scruffy etc. You and your audience deserve better than that! I just did another talk for teenagers today! It really is rewarding when you get it right. I plan to do much more of this, to complement my other work. Thanks for sharing your thoughts with us, Nigel! And keep inspiring!